With Photoshop CS3 Extended, Adobe significantly expanded the power to work with 3D models. Many users were excited by the ability to add 3D objects and modify their textures, but modeling and advanced rendering functions were missing. 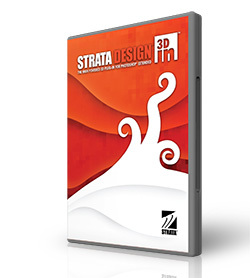 Strata offers a suite of plug-ins called 3D[in] Photoshop CS3 Plug-ins. It’s important to note that these plug-ins only work with Photoshop CS3 Extended, but that shouldn’t be viewed as a limitation. With these plug-ins, you can essentially run the core set of Strata tools as linked applications that launch from within Photoshop, then return the results to Photoshop. Now you can match a 3D object to the perspective and lighting of a photo, create new 3D layers, and generate Live 3D Web and PDF pages from Photoshop designs. Do you need all three plug-ins? That depends on what you want to accomplish. Let’s take a quick look at what each plug-in does and how easy it is to use. Strata’s ability for taking photos of real world objects and then generating a 3D model is well known. Their technology relies upon the use of a special registration matte, which is provided as a PDF. You need to print it out, then light your object and take photos. While the process is mildly time-intensive, it’s not overbearing (especially considering the alternatives). I gained significant speed after a few attempts. The model is generated using Strata’s proprietary technology. The tool is smart because it can automatically rotate and automask the images. If you aren’t satisfied with the masking, you can premask the images using the selection tools in Photoshop. The model remains interactive as it’s built, so you can quickly see progress. The tool worked very well for organic shapes and curved objects, but not as well for hard geometric objects. This is the most useful of the three plug-ins. It allows you to integrate 3D models with a photo. The plug-in includes three powerful tools for great results: Match[in], Model[in], and Render[in]. Match[in] works with Vanishing Point planes that you add to the photo. You’ll definitely need to read the manual or watch a tutorial at Strata’s site to get the hang of this, but for many users it’s a great match. It allows you to add 3D content and match the perspective of an image with Photoshop CS3 Extended. With Model[in], you can create new models from scratch, although most users will choose to import existing models or ones created with Foto 3D[in]. Render[in] gives you greater control over lighting in your image.